Officers and Enlisted Men of the 736th Medical Sanitary Company, photo taken at Newton-Abbot, Devon, United Kingdom, April 1944. 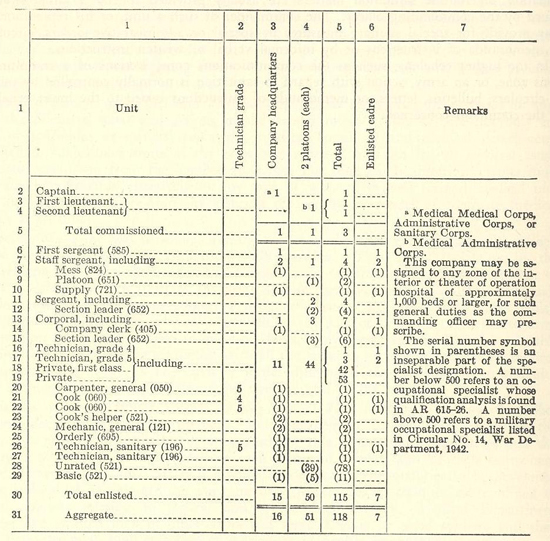 The 736th Medical Sanitary Company was officially activated by Headquarters, Ninth Service Command, Army Service Forces, Ft. Douglas, Utah (existing Army Post, with Army Air Field and home of the 7th Bomb Group (B-17), including Headquarters, Ninth Service Command –ed) 15 March 1943 with First Lieutenant Fred H. Meyers, SnC, in command. The unit comprised 3 Officers and 60 African-American Enlisted personnel (at that time the US Army was still segregated). Second Lieutenant Donald E. Erskine, Medical Administrative Corps (Platoon Leader, transferred to Cp. Ellis, Illinois, 7 July 1943 –ed). On 28 June 1943, 1st Lt. Fred H. Meyers was transferred to Ft. Douglas, Utah, and Second Lieutenant James D. McDowall, MAC, O-1541361, took over as Company Commander (promoted to First Lieutenant 10 November 1943 –ed). 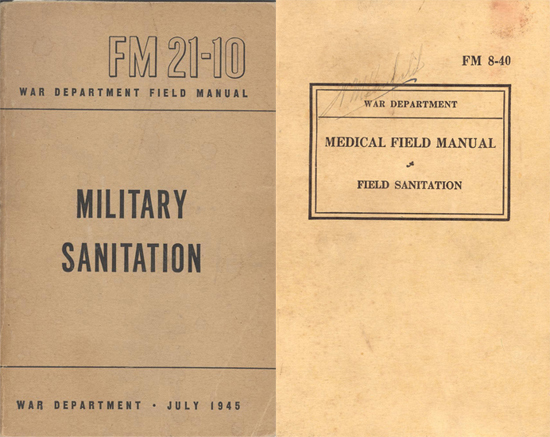 Left: FM 21-10 dated 5 July 1945, published by the War Department, War Department Field Manual for Military Sanitation. Right: FM 8-40 dated August 15, 1940, published by the War Department, Basic Field Manual for Field Sanitation. The unit’s location was on the northwest outskirts of the town of Brigham City, Utah, in the “Bear River CCC Camp” (Civilian Conservation Corps: President F. D. Roosevelt signed the “Emergency Conservation Work Act”, authorizing the establishment of CCC Camps intended to put millions of young men to work during the Depression years on reforestation, soil erosion prevention, flood control, etc., 2,650 CCC Camps were established throughout the United States, of which 116 in Utah alone, the latter providing work for 22,833 Utah men and for 28,833 individuals from other States, the program lasted from 1933-1942, and provided pre-trained manpower with experience to fill the Army’s ranks upon mobilization –ed), approximately two miles from Bushnell General Hospital, (Army General Hospital, designated by WD GO 64, dated 24 Nov 42, opened 10 Oct 42, bed capacity 3,377, specialty: neurology, amputations, neuro-surgery, deep x-ray therapy and psychiatry, subject Hospital treated over 13,000 patients during the war –ed) to which the unit was attached. Military sanitation in its broadest sense included all measures employed to prevent or control infectious diseases, to conserve the health, or to maintain or increase the physical fitness of military personnel. The procedures, measures, or activities included in military sanitation were classified as environmental sanitation, epidemiology, physical examinations, physical inspections, and personal hygiene. The Medical Sanitary Company consisted of a single Company Headquarters and 2 identical Sanitary Platoons, its main function as a Theater unit was to assist large Hospital units. A thirteen-weeks Training program was inaugurated immediately comprising 48-hour weeks in compliance with MTP 8-1 (Mobilization Training Program launched by the Medical Department 18 February 1942 –ed). The program was organized for two Companies, the 736th and the 741st Medical Sanitary Companies. Technical subjects were taught by Medical Officers from Bushnell General Hospital while Basic and Tactical courses were instructed by Unit Officers. Extensive use of training films was made, with an average of four being shown per week. The nearby countryside offered very good marching and hiking facilities, with open fields for excellent maneuver areas and simulated tactical exercises. Physical conditioning was emphasized by long marches, mountain climbs, and daily calisthenics. At the conclusion of the regular training period, an overnight field problem was simulated and held at Hiram’s Dam near Logan, Utah, which was very successful. large bathing and delousing plants are operated by the QMC (Mobile Fumigation and Bath Units which replaced the older Sterilization and Bath units). In addition to MTP 8-1 (mainly medical training courses –ed), the emphasis was placed on Field Sanitation. A Battalion Class was inaugurated for training Sanitary Technicians, and the aim was to train candidates for the Boise Barracks School (Boise Barracks Training Center, surplused 17 March 1944 –ed). However, due to a sudden change of station, the trainees of the 741st Med Sn Co were dropped from the class leaving only the 14 Enlisted Men of the 736th Med Sn Co to attend the school’s courses. 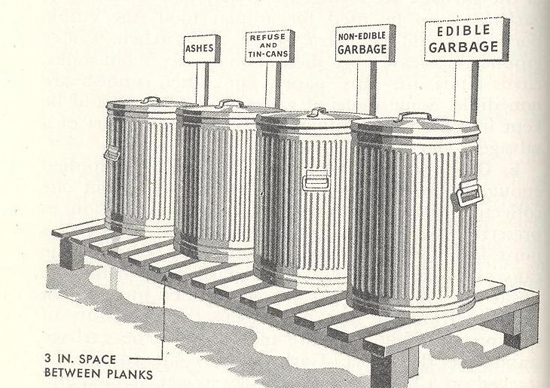 After completing the 4-weeks preparatory course, all candidates left for Boise, Idaho in October 1943, to take an extensive course in Sanitation. Following EM of the 736th Medical Sanitary Company were selected to attend the School. For two weeks, i.e. from 10 to 22 May 1943, an N.C.O. School (Non-Commissioned Officer –ed) was held. Classes were intensive with both varied and applicatory subjects, with special emphasis being placed on psychology and discipline. Examinations were given on the last day of the course and those men who had passed were selected and promoted to the cadre. In September 1943, the unit moved out by motor convoy to Cp. Williams, Utah ( training camp created in 1926, situated south of Salt Lake City –ed), some ninety miles south of Brigham City. The troops were sent through a mental conditioning course consisting of a series of obstacles and barriers that had to be crawled across under a steady fire of cal .30 machine guns firing live ammo. The men were sent through the course in squads with an N.C.O. in charge of each squad. Every Enlisted Man present completed the run successfully. Furloughs were given to every eligible Company member directly after the Training period ended in July. Recreation during off-duty hours was taken care of by a large recreation hall which was provided with pool tables, ping-pong tables, a well-stocked library, reading material, and a Radio-Victrola. The camp had its own PX (Post Exchange –ed) and a barber shop. Inside the camp perimeter the men could play horse-shoe, basket ball, volleyball, handball. Boxing matches and battle royals were staged in the ball-park across the street from the camp grounds. Brigham City had two theaters, a USO building, and organized dances and brought in music bands from Salt Lake City and Ogden. Picnics took place at the Utah State Bird Refuge where there was ample opportunity to swim, fish, play games or just lounge. All the above activities were open to Enlisted personnel. Many passes were spent in Ogden rather than Brigham City, since this town had more to offer. should be sprayed at weekly intervals with crude oil and firmly tamped. Transportation was very good regardless of the fact that there was only one railroad, the Union-Pacific. Bus lines carried commuters to and from Ogden, twenty-one miles away. There was also an electric railcar (known as the Bamburger Lines) that could be used by soldiers. It ran from Provo, Utah to Pocatella, Idaho. On Saturdays, the best barracks for the weekly inspection were rewarded with free transportation in a Company truck (most trips went to Ogden). For those men with a job at Bushnell General Hospital, Government transportation was available for both work details and official business. One of the trucks was attached to the Company to carry supplies for the camp’s kitchen, laundry, and cleaning. Furthermore, an ambulance was sent each morning to pick up the sick books from the two Companies (736th & 741st Sanitary) and return any Enlisted personnel after treatment at the Hospital. Later each Company was issued one 1 ½-ton truck, one ¾-ton Command and Reconnaissance truck, and one ¼-ton truck (to save on gas and tires, a joint motor pool was formed by the two Companies); classes were held for the Motor Sergeant as well as the drivers (3 per Company), second echelon maintenance courses given, and skills such as entrucking, detrucking, and camouflaging emphasized. All drivers ended up with actual experience in night driving, blackout driving, and cross-country driving. The camp had its own first-class mail service and well-run post office. Two mail calls were held each day, one at 1200 and another at 1750. The 736th Medical Sanitary Company was put on alert 11 November 1943 and immediately began to prepare for a permanent change of station and possible overseas duty. The necessary supplies were ordered and the required equipment requisitioned. Movement orders were received on 15 December and baggage and kitchen railcars were cleaned and loaded as instructed. After being issued with the duffel bags and the individual equipment, the men were ready for the first leg of the journey by rail. Departure took place at 1750 from Brigham City and several days later the Company reached Cp. Shanks, Orangeburg, New York (one of the Staging Areas for New York P/E –ed), where the organization would be temporarily stationed and processed in preparation for movement overseas. Upon leaving, several days later, the Company was marched to the station to board the train that would take it to the port area. Upon detraining, the men moved to a ferry that took them to the pier where the troop transport was waiting. As 1943 drew to a close, the 736th Medical Sanitary Company was on its way for overseas duty, the date was 31 December 1943. New Year’s Day found the unit aboard the “Dominion Monarch” (ex-British luxury liner –ed) somewhere in the North Atlantic as part of a larger convoy and heading for an unknown destination. Among the other vessels were Liberty ships, troop transports, aircraft carriers, destroyers and a large assortment of cargo ships from different countries. There were thousands of troops on board and tons of military equipment stored in her holds and on her decks. Virtually all branches of the service were represented. The unit’s strength was 3 Officers and 99 Enlisted Men (T/O 8-117, dated 1 April 1942 listed an aggregate of 3 Officers and 115 Enlisted personnel, while T/O 8117 dated 13 May 1944 reflects 3 Officers and 112 EM –ed). The daily routine included “Abandon Ship” drills, and the usual alerts during which everyone would report to his proper “Muster Station”, with the “Lifebelt” on; the formation would remain at their stations until the “All Clear” was given. Quarters were used for messing, sleeping, and recreation. Due to the overcrowded conditions aboard, frequent inspections were held to insure that the most sanitary conditions were maintained at all times. The ship was armed with several pieces of antiaircraft guns and fire practices were held along the voyage. Each day, weather permitting, all troops were allowed to go up on deck for calisthenics. Several men became seasick and had to be carried on deck for the exercises, others were more fortunate and enjoyed the good air. To while away the time, men played checkers, cards, but other than that there were hardly any other means of recreation. of the 703d Med Sn Co). The convoy reached Liverpool, England, on 9 January 1944 after an uneventful journey. After debarkation, the unit was immediately taken to a large railway station. On their way the men noticed the large bomb craters in the dock area, buildings in ruins, and wrecked equipment, mute evidence of recent enemy raids, and war. Regardless of this, docks were certainly humming with activity. The disembarking troops were given ‘thumbs-up’ signals from the locals, a fine example of British courage, and they were impressed by it. At the train terminal, the Company was split into two groups. Headquarters Platoon + First Platoon, and Second Platoon. Headquarters and First Platoon were attached to the 316th Station Hospital, and Second Platoon went to the 315th Station Hospital. The first group (attached to the 316th Sta Hosp –ed) proceeded to Newton-Abbot, Devon, where they arrived the next day, 10 January 1944, while the second group (attached to the 315th Sta Hosp –ed) went to Axminster, also in Devon. Upon arrival Company Headquarters, under command of First Lieutenant James D. McDowall, MAC, O-1541361, was set up and details were assigned. Some of the personnel went to the kitchen, the dispensary, the X-ray room, and the fire station. The remainder received tasks within the ground improvement details. Ditches had to be built to drain the area, and a sanitary area was started. The camp comprised an area where exhibitions of all Sanitary conveniences to be used in the field were held: the Serbian barrel – the lined ditch – the improvised shower – the rubber delousing bag – trench incinerators – urine troughs – the closed ditch, and many others. The Signal Corps sent a photographer down to take pictures of the area after it was completed. During their stay, the EM worked on various details including an overhead ramp, built for the convenience of the patients when going from one ward to another during inclement weather. Another job consisted in doubling the floor space of the entire Hospital. Ward tents had to be pitched and concrete floors poured. The job was completed in due time and Lt. Colonel M. A. Johnson (CO > 316th Station Hospital) was very pleased with the results. Morale was very good, as there were plenty of recreational facilities available at the station. Enlisted personnel were allowed passes to nearby towns and 7-day furloughs to visit historical places they had never seen before. Plenty of relaxation was available in theaters, movie houses, dance halls, and pubs, and religious services were held on the Post and in Newton-Abbot. Company Headquarters and First platoon were alerted for departure on 26 May 1944. Unfortunately one of the trucks with men returning from detail overturned on the highway and several men were injured, with the vehicle being wrecked beyond repair. Consequently, the move was postponed until the next day. The 3 injured members of the unit were left at the Hospital. The 736th departed at 1500 27 May and were transported to the Newton-Abbot main railway station, departing at 1600 hours for Brockenhurst, Hampshire, where they were taken to their new station at Beaulieu, Area B-5, as per VO GC XVIII District (Vocal Orders, General Commanding, XVIII Corps District –ed). Upon arrival an air raid was in progress and everyone was ordered to find shelter. The group was attached to the 28th Field Hospital. While at this new station, the men were held in reserve as potential litter bearers for the impending invasion of the Continent. Practice ramps were constructed and ambulances obtained for class purposes. There was a P-47 Thunderbolt Fighter Base nearby and it was here that the group gained invaluable knowledge in Allied aircraft recognition. One of the next assignments was to furnish litter bearer teams to the nearby hards at Lymington, Lepe, and Stoney Point (when the Invasion started, some of the teams were brought to Lymington, however no American casualties were received at these hards –ed). 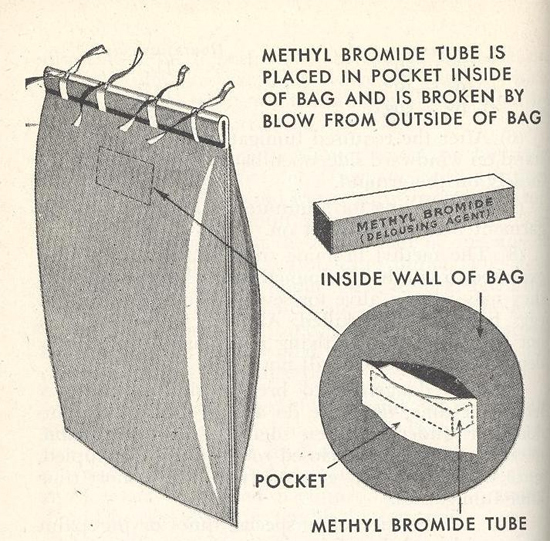 After proceeding to Axminster, Devon, 10 January 1944, the group under command of Second Lieutenant Jerry J. Maly, MAC, O-1544914, carried out the same sort of details that the first group had done, except for the Sanitary Exhibition. Close contact was kept between both groups and several men were exchanged for jobs for which they were more suited. The 315th Sta Hosp also required several ground improvements and a land drainage system. Concrete floors for ward tents were also constructed. The American Red Cross was also very active at this station and Enlisted Men were provided with many recreational facilities. Officer Ellsworth B. Nowell, MAC, O-1544754, was promoted to First Lieutenant, effective 1 April 1944. On 3 May 1944, the Platoon was moved to Millbrook Medical Camp, Hampshire, where they were instructed to unload casualties off the Hospital Carriers and LSTs bringing in patients from the battlefield. A hasty but strenuous training program was set up for handling litter patients. When the casualties really started coming in from the Invasion beaches, Second Platoon was tasked with unloading the different landing craft, working in conjuction with the 703d Medical Sanitary Company (also stationed at Millbrook –ed). Wharves and hards could accommodate only 5 LSTs at once, and after being cleared of casualties, the ships remained docked or beached until reloaded with troops and cargo vitally needed in France. All units temporarily stationed on site were placed under control of Headquarters, 93d Medical Gas Treatment Battalion (CO > Colonel Joseph W. Palmer, MC –ed). When off-duty, some men were allowed to have passes to Southampton or engaged in sports. On 11 June 1944, the Company was reunited at Millbrook Medical Camp. When the 93d Med Gas Tr Bn was withdrawn it was replaced by the 186th Medical Battalion which took charge of the hards at Southampton, replacing the 33d Medical Battalion (CO > Colonel Frederick K. Knoblauch, MC –ed). The 736th would move to the boats and landing craft bring the patients out to the waiting ambulances or led the ambulatory cases. They handled a lot of American wounded, German PWs, and some French casualties during the job. The organization had already been alerted on 9 June for a possible cross-Channel voyage. The allocated code number for the unit was 3857-B. On 12 August 1944, 3 Officers and 107 Enlisted Men departed Millbrook, and transferred to Camp # 14, Weymouth, England, where they arrived at 1700 the same day. 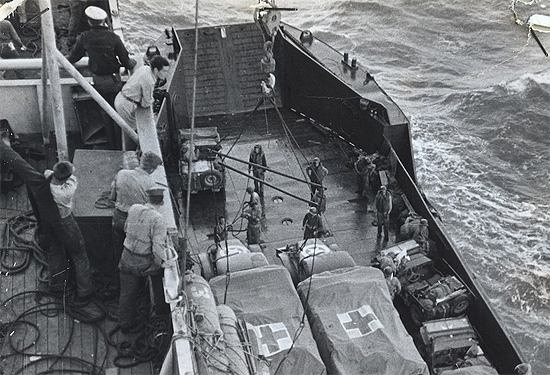 The 736th Medical Sanitary Company embarked on its short sea trip from Millbrook Medical Camp on 13 August 1944. 2 Officers and 98 Enlisted Men were assigned to LCI # 84 (US), while 1 Officer and 9 EM were assigned to LST # 1237-B. The latter group was made up of drivers and supply personnel, in charge of the organization equipment. Final destination was Utah Beach. The trip across the English Channel was short and uneventful, but the landing had to be postponed due to rough seas. On 15 August 1944, the group aboard LCI # 84 was transferred to LST # 443 and carried within wading distance of shore. After landing, the men were directed to Transit Area B, where they bivouacked for the night. The next day, the group from LST # 1237-B arrived at Utah Beach disembarking without problems. On 16 August, the 736th moved to Medical Depot M-2 one half mile east of Chef-du-Pont, France. While at this location the men worked as loaders at the Depot. They sometimes loaded medical supplies consisting of as many as 75 2 ½-ton cargo trucks. Four days later, the unit moved to Cherbourg (liberated 26 June 1944 –ed) where the men were held in reserve for any details the Normandy Base Section Surgeon might have for them to do. Billets were obtained in former German temporary barracks. As there were still many booby-traps in the area and abandoned enemy equipment, the men were warned not to tamper with ‘booty’ until it had been thoroughly checked. On 15 September, the unit proceeded to Rennes, Brittany (liberated 4 August 1944 –ed). After arrival the 736th was assigned a bivouac area just outside town, where they awaited their next mission. On 22 September, the entire unit comprising 3 Officers and 107 EM departed from Rennes traveling to Brest (liberated 19 September 1944 –ed), which they reached at 1200 hours on 23 September. They only moved into the city two days later, and received their primary mission, which consisted in the burial of all dead animals (about twenty animals a day were buried –ed), and any other sanitary measures deemed necessary to observe the health standards of the city. The Enlisted Men were also instructed to remove German rations and food abandoned in the submarine pens that were creating a fly-hazard. During their stay, 4 EM were lost to the Brittany Base Section Guardhouse, and 2 more were lost to a local Hospital. On 17 November, 3 Officers and 101 Enlisted Men left Brest via rail for a change of station. During a stop-over at Chartres, the men took some time to visit the Cathedral in the city. The group arrived at Liège, Belgium at 0600 the morning of 21 September. 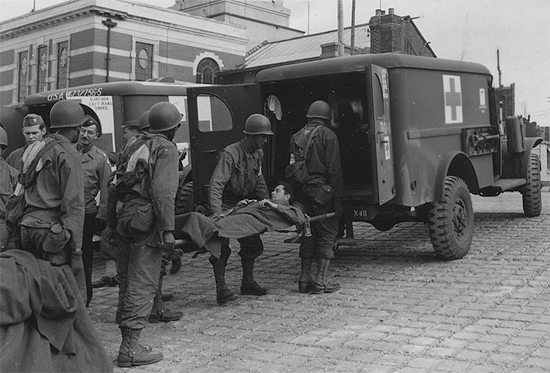 Once again, the unit was split into two groups; 2 Officers and 60 Enlisted personnel were attached to the 9th Field Hospital, while 1 Officer and 41 EM transferred to the 46th Field Hospital located at Pépinster, Belgium. Their task would consist in handling patients in both Hospitals and support movement of patients during influx and evacuation at the respective Field Hospitals. Another job entailed loading and unloading patients off the Hospital Trains. Headquarters and First Platoon (attached to 9th Fld Hosp) lost a few men victim of a direct bomb hit on 27 December that destroyed part of the 9th Field Hospital installations and ruined most of the rest. Among the casualties, were 1 Officer and 3 men from the attached sanitary unit. The organization fell back with the 9th Field, moving back to Tirlemont, Belgium, for fear of an enemy breakthrough (Germany launched a massive counter-offensive in the Belgian Ardennes on 16 December 1944 –ed). Second Platoon (attached to 46th Fld Hosp) was also subjected to frequent air attacks but suffered no casualties. During the German thrust, some German parachutists were dropped in the vicinity and some were captured very close to the installations run by the Hospital. Subject Platoon later moved to Verviers, Belgium, where it was housed in the old ‘Athenée ’ (school house –ed) until the end of 1944. This is where the available Unit History stops … as no more archived documents were discovered, it was impossible to finalize the organization’s further service during WW2. Summary of Operations – 736th Medical Sanitary Company – E.T.O. September 1944 – disposal of dead animals (approximately 350 horses and cows buried and/or cremated), fly control (large percentage of flies exterminated or controlled), collection and storage of medical supplies (large volumes of medical supplies collected, stored, and assorted). October 1944 – disposal of dead animals (approximately 75 horses and cows buried and/or cremated), fly control (flies almost completely under control), collecting, assorting, and storing of medical supplies (remainder of medical supplies collected, assorted, and stored). November 1944 – disposal of dead animals (approximately 50 horses and cows buried and/or cremated), fly control (flies completely under control), water supply (several 100 feet of water pipes laid), evacuation of patients (large number of patients transferred and/or evacuated), essential duties performed by EM as Medical and Surgical Technicians. December 1944 – evacuation of patients, essential duties performed by EM as Medical and Surgical Technicians. January 1945 – evacuation of patients, essential duties performed by EM as Medical and Surgical Technicians. We are greatly indebted to Lynn McNulty, son of Captain Frederick J. McNulty (ASN: O-526873) for having generously supplied us with vintage reports of the 736th Medical Sanitary Company. Any additional data relating to the unit will be very much appreciated.